When I was a kid we always had a ton of people over on the weekends, especially in the summertime. My dad would have the grill going, my mom would get the snacks out, and most of us would enjoy a dip in the pool. As an adult, that hasn’t changed. Neither has people coming over on the weekends. Only now, they come to my house. 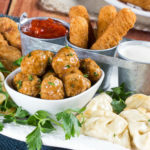 I may not have a pool, but my son immensely enjoys sharing his newfound peek-a-boo skills with the family, while my husband loves finding new and fun ways to serve up the grub, especially for holidays like the Fourth of July. Sometimes though, creating easy dessert recipes that don’t take up a lot of time can prove to be a challenge. Especially since everyone has different tastes. We’ve often put out a variety of desserts to make sure everyone gets a sweet treat, but that can be a little tedious or steep on the wallet. 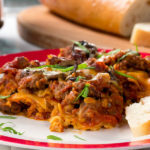 Luckily, there are plenty of perks when it comes to being an editor at the Mr. Food Test Kitchen, like when I need to figure out how to create something budget-friendly, but that will also work for a large crowd. I know Howard and the team will be able to help me figure something out, and they definitely did! 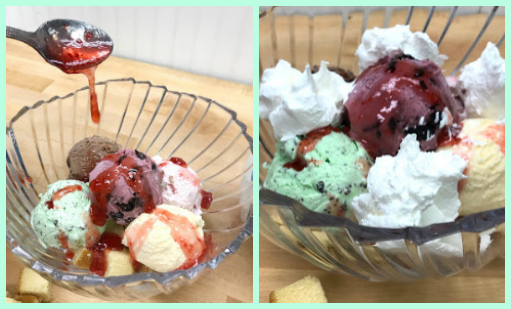 So, today I’m going to help you solve that variety problem by showing you how to make a super fun ice cream dessert that’s guaranteed to satisfy everyone’s sweet tooth in one go. Plus, July is National Ice Cream Month, and that means ice cream has the best prices of the year! Trust me, no one will be able to resist our Family-Style Ice Cream Trifle! It’s one of those summer-perfect desserts that can be made in a flash, so you’ll have more time to spend with family and friends, or, if you’re a mom like me, you’ll have more time to keep the kids out of trouble. 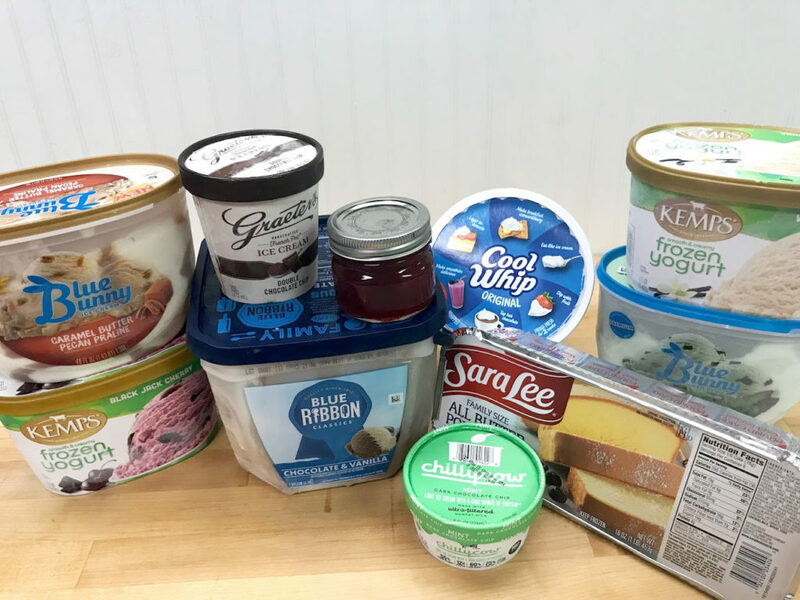 You can find all these yummy ingredients, and more, in the freezer aisle of your favorite grocery store! Let’s gather our ingredients! When I said this was one of those easy dessert recipes, I wasn’t kidding. Head to your favorite local grocery store, and go straight to the freezer aisle to grab a frozen buttery pound cake. 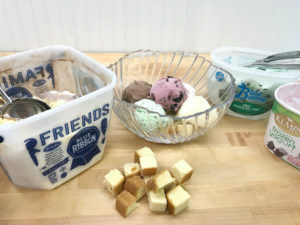 Then, choose five or six of your favorite flavors of ice cream, frozen yogurt, or a combination of both to get started! (Yes, both Blue Bunny and Chilly Cow are mint chocolate chip. It’s my favorite flavor! And yes, I still added some other flavors for everyone else!) Plus, we’re going to add in some strawberry ice cream topping, and Cool Whip. Pick your favorite large bowl, and make sure it’s freezer-safe. I like to use a see-through bowl, so that all the layers and colors are vibrantly displayed. 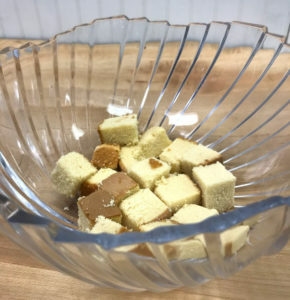 Once you’ve settled on that, cut the pound cake into cubes and layer the bottom with half of it. Next, we’re going to add so much creamy goodness to this baby, the fam won’t be able to resist. Mine sure couldn’t! Now comes the fun part. Start scooping up all that ice cream, using about half in the first layer. Mix and match with as many varieties as you can handle. (Don’t worry, I won’t tell you that you have to use an excessive amount of mint chocolate chip.) Once you’ve packed that layer with all the family faves, you’re going to drizzle some sweet strawberrylicious ice cream topping over it, before adding large dollops of the whipped topping! It already looks so temping at this point. If you’re anything like me, you might have the urge to lick the scoops, but we’ve still got one more layer to go before this baby is done, so resist the urge until then! Repeat steps two and three! Add more pound cake, more ice cream, more strawberry topping, and more whipped topping! 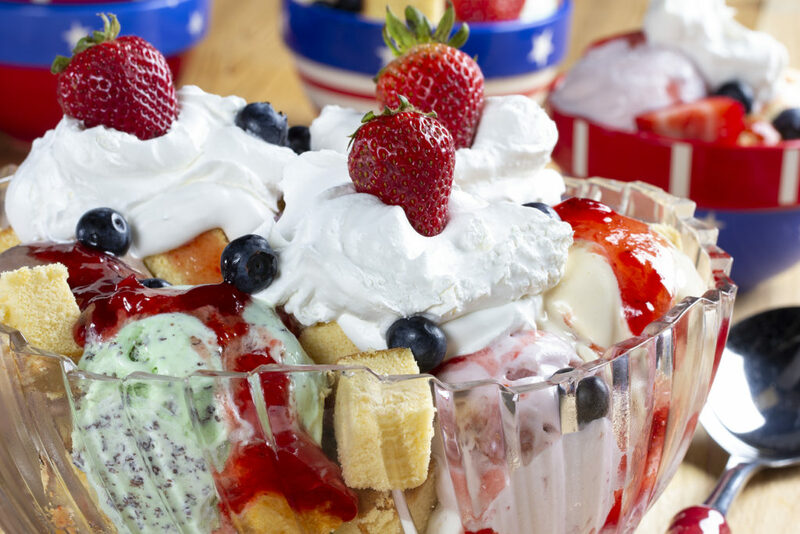 Now, if you want to make this super patriotic for the Fourth of July, garnish it with strawberries and blueberries, serve it up in some individual red, white, and blue bowls, and sit back to enjoy the fireworks! Remember, July is National Ice Cream Month, so everyone might want to stock up on their own supply anyway. Let the kids help scoop the ice cream, drizzle too much strawberry topping, and add way too much whipped topping! This is one the whole family is meant to enjoy, and sometimes, the best memories happen when those easy dessert recipes get a little messy, so don’t be afraid to have fun with it! 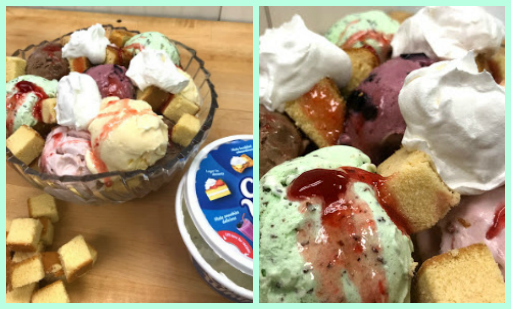 FAMILY-STYLE ICE CREAM TRIFLE RECIPE! This looks absolutely delicious !!!! Nat’l Peanut Butter Cookie Day!